It is exciting when a child reaches developmental milestones like crawling, walking, talking, and taking care of himself. Although children develop at their own pace, when a baby is substantially slower at reaching developmental milestones compared to other babies of the same age, this may be considered a developmental delay. Sometimes developmental delays are the result of genetic factors. However, they may be the result of brain damage caused by negligence by a doctor or nurse during delivery. If you suspect that developmental delays have arisen from a birth injury, you should consult an experienced attorney. At Moll Law Group, our Chicago birth injury lawyers are available to investigate the cause of the developmental delays and sue the responsible parties for compensation. 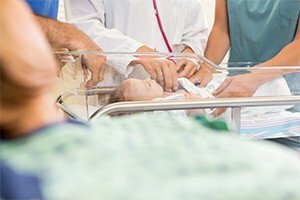 Birth injuries are injuries that happen during labor or delivery. For example, if a doctor does not notice a prolapsed umbilical cord and does not perform a C-section, or if a doctor uses a vacuum improperly during delivery, these can cause a lack of oxygen or damage to the brain. Sometimes brain damage or oxygen deficiency is not noticed right away, but it may become apparent as the baby develops more slowly than other babies. When developmental delays are serious, they can require long-term medical care. This may entail physical therapy, operations, or a full-time nurse to care for the child. Often, the only way for families to pay for all of the care necessary to address developmental delays is by suing the health care providers that caused the birth injuries that produced the delays. An experienced attorney can investigate whether medical malpractice caused the developmental delays. To recover damages, you will need to establish that the physician owed the baby a duty, there was a standard of care that the physician violated, the baby suffered from developmental delays, and the physician's failure to meet the standard of care caused the developmental delays. In other words, you need to establish that an OB-GYN did not respond to events during your labor or delivery in the same way that competent OB-GYNs would have. Usually, it is necessary to retain a credible expert, another board certified OB-GYN, to testify as to the standard of care, the defendant’s failure to meet the standard of care, and damages. In Illinois, you will need to file an expert report and affidavit after filing your complaint. These must state that there are reasonable and meritorious grounds to file suit. When a baby suffers developmental delays that affect his or her quality of life and require medical care, and you can establish a causal nexus between a health care provider's actions or omissions and the injuries, you likely can recover compensation. This will include both economic and noneconomic damages, including the financial and emotional losses suffered by the parents. If your baby suffered developmental delays due to medical malpractice, the Chicago attorneys at Moll Law Group are available to sue the responsible health care providers on your behalf. We represent families in Naperville, Wheaton, Schaumburg, and communities throughout Cook County. Billions of dollars have been recovered in cases in which we have been involved. Call us at 312-462-1700 or contact us online to schedule a free consultation with a medical malpractice attorney.